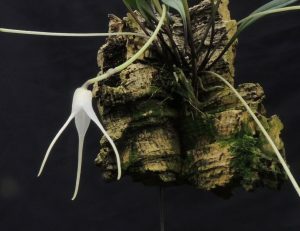 We have lots of Masdevallias flowering this week. One of my favourites is this small growing species from South America. 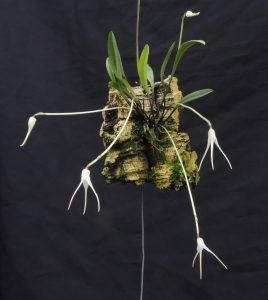 Masdevallia guayanensis (despite its name) is found in Venezuela, and northern Brazil as well as Guyana and grows as an epiphyte in moist forest at around 1800m altitude. The leaves are about 5cm long and over time it forms a tight clump which then produces a profusion of relatively large and rather elegant white flowers. It is rather pendant in its habit and it works really well mounted especially as the stems are dark and contrast really well with the bright green leaves and clear white flowers.